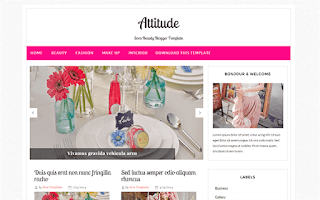 Attitude Blogger Template is a Beauty Blogger Template created specially for makeup blogs, hair blogs, fashion websites & general feminine blogs. Every element of this theme is well crafted and makes your site look professional website and you get maximum exposure to your content. Attitude is a simple blog theme for your needs and it works well with all desktop and mobile devices and has ton of built-in features.